The sequel in the International Bestselling Afterlife series. It is Meghan's second year at The Academy. While trying to help and care for Jason on earth she is struggling to keep up in school, where they this year will learn both to ride Pegasus' and fly through severe storms. Meanwhile Mick is becoming more than a friend to her and soon she finds herself facing the unavoidable choice. But something evil is threatening the students at the Academy and Meghan is no longer safe within the walls of the castle. Something causes several of the students to be caught in the middle of a nightmare, that they can't wake up from. Soon they realize that they might have a traitor in their midst. 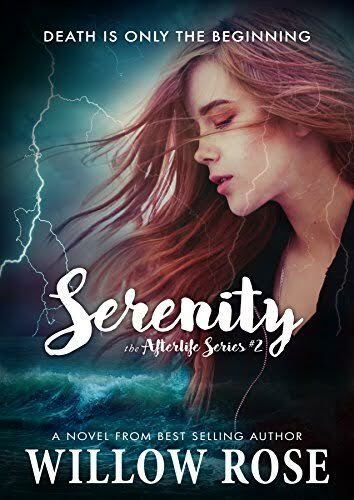 Serenity is the second novel in Willow Rose's Afterlife-series. Its a Y/A Paranormal Romance. It is followed by Endurance - Afterlife#3 and Courageous - Afterlife#4.